Well naturally I get critical responses that the way everything has to collapse is only through HYPERINFLATION. I would love to see just one empire that has ever collapsed in such a manner – not Babylon, Athens, Hellenistic Greece, Rome, Venice, Holy Roman Empire or even Britain. I fail to grasp this insistence upon something that historically has NEVER happened in 6000 years of recorded history. When the CORE economy collapses, as we are experiencing currently, governments always become draconian. When I say they are after the underground economy that is by no means localized. This is a global trend. France and Italy are the tips of the iceberg. Greece is going after people that left their homeland. They PRESUME all will be OK if they can just get their hands on more money. As this takes place, corruption soars and the rule of law collapses. We are likely to see Europe adopt US law and begin to enslave their citizens demanding taxation worldwide based solely upon your citizenship at birth. Look at Spain – it is unbelievably cheap now!!! (DEFLATION). Not necessarily property prices, but everything else – supermarket prices are about half of those in Austria/Slovakia and about one third of those in Canada, rents are ridiculously low (e.g. 400-600 euros for central, decent looking apartments of 2 bedrooms), etc. In Singapore that is $10,000 a month. In Zaragoza, which is unbelievably cheap, clean and orderly, there are no beggars or homeless to be seen anywhere on the streets, and there are still plenty of people out in the evenings. It’s shocking that big Spanish cities are so much cheaper now than those in Latin American cities and still have a huge quality of life advantage (i.e. nice enough, civilized in Spain vs. unsafe and often total hellholes in parts of Latin America). Spain is in meltdown mode. 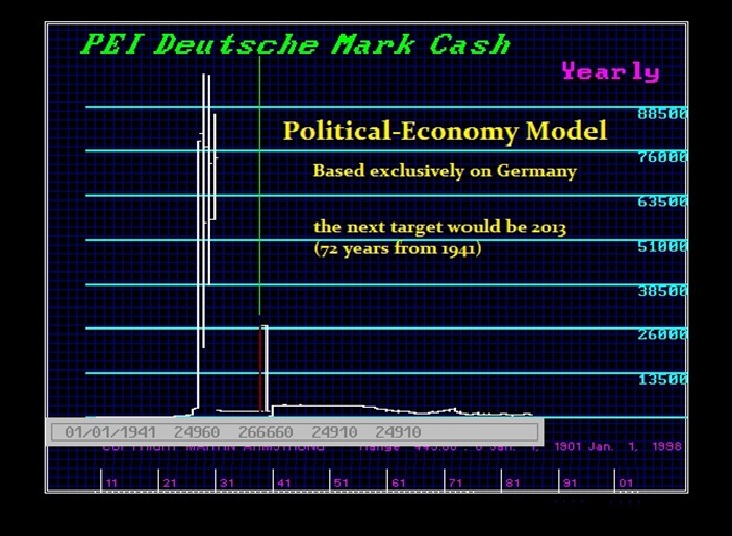 Yet because it cannot unilaterally control the Euro, we see DEFLATION instead of INFLATION. As money rises in value, prices fall. Spain is providing residency status if you buy real estate. This is an effort to support the local real estate market since banks are unable to lend long-term. Debt is LEVERAGE. Because you can borrow for a 30 year mortgage, home prices rise to reflect the ability to pay effectively 30 years worth of income today. Eliminate the ability to borrow and housing prices collapse to the level of available cash. HYPERINFLATION is not possible in Europe when no single country controls the money supply. The debt levels are so high in Japan a 0.5% increase in interest rates will cause massive deflation as bond prices collapse sharply for that will be virtually double interest rates. In the US, housing has not recovered sharply because banks have now swung so far in the opposite direction that the due diligence takes months to deal with a mortgage. Hyperinflation unfolds ONLY when nobody buys the bonds and that forces government to create money to pay debts.Here is a chart of the German Currency during the Hyperinflation of the 1920’s. How can anyone in their right mind suggest this will happen to the USA when it is the core economy and the reserve currency? When it happened in Germany and in Zimbabwe, the core economies watched in awe. It did not impact them. If such a scenario took place with the USA, there would be war before you got half-way there. You would wipe out the world reserves everywhere. That is the difference with a core economy.As a core economy, there is no such unchecked outcome. Everything is connected. Besides, the USA is still the best debt-wise. Europe is being torn apart at the seams because they failed to create a national debt that was critical to create a single currency. Can you imagine if there was not federal debt, only state debt, and all 50 state’s debt was reserve quality. That is what Europe adopted. Complete chaos for undermining the individual debts undermines the entire banking system. Japan is a real basket case. Don’t worry. We are melting down. The worst of the worst is still unfolding. It is the difference of just printing oblivious to reality, or restraining printing while attacking society. That is what Rome did. Core economies have ALWAYS, without exception, turned against their own people. They historically die by their own hand – suicide.